Not where I want to be really - I would much rather be in Chinese Taipei with the Great Britain team racing round parks and museum gardens. After my test race victories, I took a few easy days, did a little mapping work etc, but somewhere along the line I picked up another cold. The tough weekend combined with some stressful events during the week must have lowered my immune system enough so that by Friday/Saturday I was feeling really rough. On Saturday I was lucky enough to be at Matt Crane and Grace Elson's wedding in Sheffield, but all I could do on Sunday was drive back to my parents house, drop out of the team and get into bed. My plans are now simplified, I will return to Sweden when I feel better, take part in the Swedish Sprint Champs, then 2 weeks before WOC I will take part in the Karst Cup in Slovakia which I feel will be a relevant challenge for the Hungarian forests. Then I will finalise my preparations back in Stockholm (trying not to get sick!). This weekend was the last round in the UK Cup, with sprint, middle and long races which were also the test races for the British team for the World Championships in Hungary. The races were held in the Forest of Dean, near South Wales. 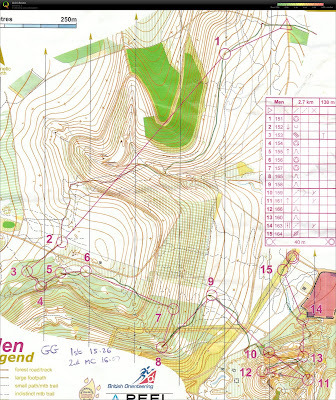 The terrain is quite relevant for Hungary, although the vegetation and mapping in some areas made finding controls tricky and possibly resulted in all runners making more mistakes than usual. Friday was a forest sprint like Hungary will be, although it was probably too 'foresty'. Everybody made a lot of mistakes, but I ran quite well, taking my time to read the map and not make mistakes. I passed Scott Fraser already at the second control, but he caught me again at 5 when I overshot slighty, and we ran some of the race together. I was in front until 10, when I rushed and didn't take the time to read the map, and he was ahead until 14, when he tried to run straight through the undergrowth (big mistake). I won by 40 seconds, and I estimate I lost 30 seconds, 10 at number 5, and 20 at number 10. The middle distance was similar to the sprint, with most runners making mistakes. Again I managed to minimise my time loss, and took the victory, only 14 seconds ahead of Speakey. I was really hesitant to the first control, and indeed round the first loop, and I lost around 45 seconds on number 6, and at the 6th control I was 1 minute behind the fastest (but a lot of people lost more!). Then I ran quite well except for small misses at 12 (misread the vegetation crossing the track and lost ~20 seconds), 15 (control was on the same level as 14 in reality, so was too low!) and 16 (deep bracken made contours hard to read and flag very hard to see). At 16 I was 1 minute behind Speakey, but from there to the finish I ran almost perfectly, and I won the long leg and the tough uphill leg to 22 taking a lot of time out of most runners. Sunday was the long distance, perhaps the race I had been most looking forward too. I was a little worried that my recent illness might affect me most in this race, but I felt strong until almost the very end. 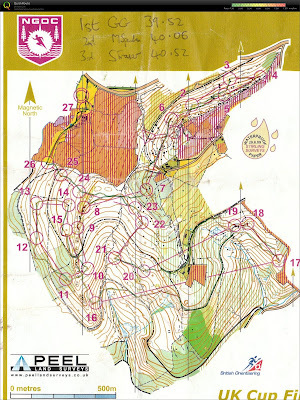 My focus was on really reading the map well, trying to avoid the undergrowth and find eady ways into the controls, and really push the pace on the longer legs when I could. I started quite well, and took the lead from the 2nd control. I lost around 15 seconds at the 3rd, when I stopped a little early and the control was a little hidden in bracken, and I lost 45-60 seconds at the 4th, when my route choice took me into a part of the map which I don't think had been updated recently. The open area never finished and I ended up running much further down the fence than planned. I had a nice line into the control though, and although I didn't see him, I heard my 3 minute man, Speakey running away from 4. I caught sight of him coming out of 6, although I didn't get close to him until much later. Wobbled a little on 8, then had a slightly bad patch through 10-15. I didn't really make mistakes, but I was just hesitant and slow reading the map, and I lost maybe 1.30 through that section to the best. I don't know if my route to 16 was the best, but I won the split, passed Matt Crane and caught sight of Speakey again. From there to the finish I gained on him, taking a better route to 20, so that I punched 22 just after him, but I had nothing to beat him into the finish. Another victory, 2 minutes ahead of a very impressive run from 21yr old Rhodri Buffet, and 3 mins in front of Speakey. 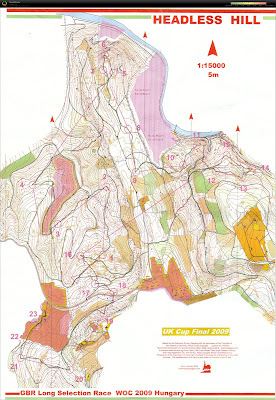 3 races, 3 wins, selected for my preferred races at WOC which are sprint, long and relay. And I won the UK Cup for the first time since 2005 with 4 wins and 2 seconds.